Kim Grant masterminds Grand Ole Echo and keeps the roots scene rocking in Los Angeles. She shares her LA-Roots-community-centric “Best of ” 2010 list. Here are her favorite places to get rootsy around town. 1. Best Roots Radio in LA: KCSN tops my list with shows like; Americana Matinee, The Dylan Hours, Twang! Tangled Roots and Bluegrass Etcetera. 2. Best new Roots-Rock band on the scene: “Wheelhouse” with former members of The Broken West and Everest. They’re so new they don’t have a website, but you can read about the lead singer/guitarist, Brian Whelan here. 3. 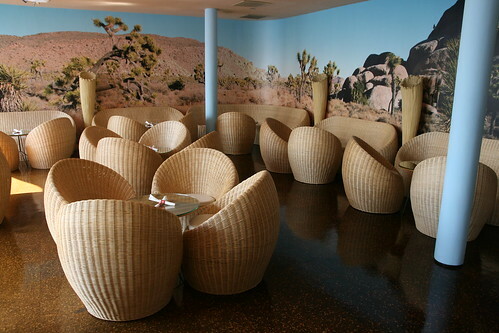 Best ‘hidden’ Roots music Venue: The Cactus Room at the Standard. Former Pioneertown Motel Manager, Rachel Dean, has a hand in booking monthly some of the best roots music on Sunset Strip. Recently I saw Neal Casal (of Ryan Adam’s fame), Susan James and Michelle Vidal play and most recently they had the great Americana Rocker, Tim Easton hit the stage playing against a backdrop of groovy desert wallpaper. 4. Best place to find your 1960s and ’70s hippie dresses to wear to shows: Stuck on Vintage. And there’s some ’80s and ’90s for the Indie folks, too! 5. Rolling with the times, the Grand Ole Echo gave up the BBQ on the backporch (we still have music out there!) and have been hiring food trucks to stop out front. Best Burger food truck: The Patty Wagon. They use grass-fed beef and pride themselves on sustainable local ingredients. 6. Best record of 2010: Dave Gleason‘s Turn and Fade. Dave Gleason’s well-known as a Honky Tonker and one of the B-Bender Kings, and he retains that status on this record while departing for some soulful shores at the same time. The song, “Pale Blue” is a standout tune. Sadly, LA just lost him to Nashville. 7. Best new Western-inspired store: Ranch n’ Roll. Libby Knudson used to have this shop in Seattle and just recently opened in LA. Furniture, clothing, purses, totes, jewelry, art ..hand made goods that refect the Western lifestyle and a center for re-upholstery! She’s now running with a brilliant idea, “Club Hotpad” where you can sign up to receive hand-made potholders monthly designed by folks like Excene Cervenka and Dave Alvin (to name a couple). started presenting a “70s Show” bringing together various people in the roots and pop communities of L.A. and inviting them up with his “Chaos Band” to sing a ’70s song of their choice. There’s usually about 20 performers and some of the choices are surprisingly funny and well-done. 10. Best place to catch the Roots scene under one roof: Roots Roadhouse. Is it okay to toot my own horn?…2010 was the first time Liz Garo and I (along with the fabulous Echo crew) attempted to stage a Grand Ole Echo Festival. We used the Echo, Echoplex and the parking lot and had 20 bands including Dave Alvin & The Guilty Men, T-Model Ford, Chatham County Line, Frontier Ruckus and local acts such as I See Hawks in LA, Old Californio and Olin & the Moon. Most fun ever, and we hope for many more! To learn more, check out The Grand Ole Echo.